Try our classic Double-Extra Large T-shirt to satisfy that double-extra-large craving. Have it with a Biggie-size drink to go! 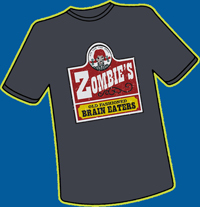 It's braaaains—better than fast food...it's Zombie's.